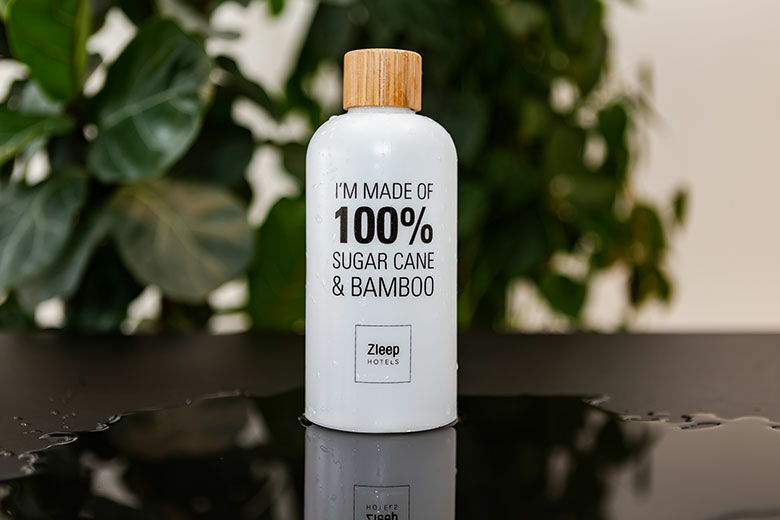 The environment has always been an important core value for the Danish hotel chain Zleep Hotels, and now the chain is introducing yet another green initiative. This time the eco-friendly initiative can be bought by hotel guests for subsequent use. By investing in the water bottle every refill will help create a greener future. Arboform also called liquid wood. By investing in the bio-bottle instead of disposable bottles, the hotel chain reduces the emission of greenhouse gases and minimizes the transport of water on plastic bottles. “As a modern hotel chain and company, it is important to take environmental responsibility and provide the best possible conditions for people and the environment – both now and for future generations. I am pleased that we can add another initiative to Zleep Hotel Aalborg’s way of thinking sustainability. The new green initiative matches our solar cell panel and green plantation on the roof top, and it is great that we are already receiving positive comments on our new water station and the bio-bottle,” says Emil Hauge, Hotel Manager at Zleep Hotel Aalborg. The bottle is sold at the purchase price and is as a start only available in limited edition. In the breakfast buffet the chain guarantees 30-60% organic products and by using small plastic packaging for butter, cheese and jam, food waste is reduced, and the hygiene is increased. several days in a row, to turn off the water and to return the reusable key card at check out. In addition, the soap is organic, the trash bags are made of recycled materials and the chain’s Zleep pens are made of grain and bio-plastic. At many of the hotels’ roofs, Sedum plants are planted, which absorb large amounts of rainwater and minimize CO2 emissions, and the solar panels ensure a greener energy consumption. Zleep Hotel’s eco-friendly focus is reflected in the chain’s value set, where the value “Environment” is a key part. In addition to the above-mentioned measures, it is also important for Zleep Hotels that their suppliers, investors and business partners think green when new hotels are to be built. “As individuals and as a hotel chain, we devour the planet’s resources every day. Therefore, we are constantly seeking new ways in which we can ensure a greener environment. Everything from sustainable building materials and processes to small initiatives in the daily hotel operation are of value to the environment. There is still a long way to go but all green initiatives count. The water bottle at the hotel in Aalborg is an exciting new step in the right direction, and I hope that together we can drink our way to a greener future,” says Peter Haaber, CEO of Zleep Hotels, about the hotel chain’s environmentally friendly profile. Zleep Hotels is a part of Deutsche Hospitality’s brand family. Zleep’s vision is to always deliver quality, service and design at a great rate for the many. Today, the hotel brand consists of 10 hotels in Denmark and one in Sweden. A total of four hotel projects are already published and in the pipeline. The goal is to operate 40 hotels in 2025. To realize this goal, Zleep Hotels must prove its competences to be considered an attractive franchisor, partner and investment. Deutsche Hospitality’s acquisition of a stake in the brand is a stamp of approval for property developers. Beside Zleep Hotels the umbrella brand Deutsche Hospitality combines four well-known hotels brands: Steigenberger Hotels and Resorts, MAXX by Steigenberger, Jaz in the City and IntercityHotel. Deutsche Hospitality’s portfolio currently encompasses a total of over 130 hotels on three continents. Read more about Zleep Hotels. Read more about Deutsche Hospitality.